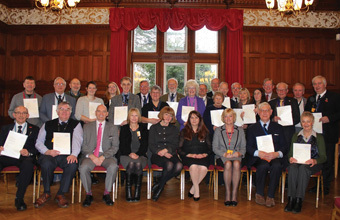 STAFF and volunteers at Bletchley Park have been presented with the nationally recognised Welcome Host Gold customer service certificates. At a special ceremony to celebrate the occasion and recognise Bletchley Park's commitment to customer service, the award was presented by Welcome to Excellence's training services director Sue Gill. Operations manager Fred Howe said: "We are delighted that we chose Welcome Host Gold as our in-house customer service programme because this gave us the ability to train our own trainers who are able to deliver tailored courses that fit our business and customer needs. "The results are impressive as visitor numbers have increased by 28 per cent compared to the same time last year. "The welcome our visitors receive will be paramount to the success of Bletchley Park and our dedicated team of staff and volunteers have a passion for interpreting the untold stories of what used to be a very secretive place."